[page 2] “released from the lease” we may have plenty of time to move. If we have to keep this, I think we will move by car loads. At least that will be easier (I think). I hope to be able to stay put for a while after moving to our new home. Dad is attending a lunch today with his “boss” and a professor. I don’t know what the purpose of the affair is, but at any rate he won’t be home for lunch, but has the afternoon off and we are going to take the abstract to a lawyer’s office to have it examined. Also buy Dad a new raincoat, and do a few other things. Since we have been here I haven’t bought anything new, but a hat and 3 pair of hose. I decided since no one around here had seen my clothes, I don’t [need] any new ones – (until next year when we go traveling again). The enclosed came and since it didn’t have a 5₵ stamp, I opened it and decided to send it on. It was addressed to us. 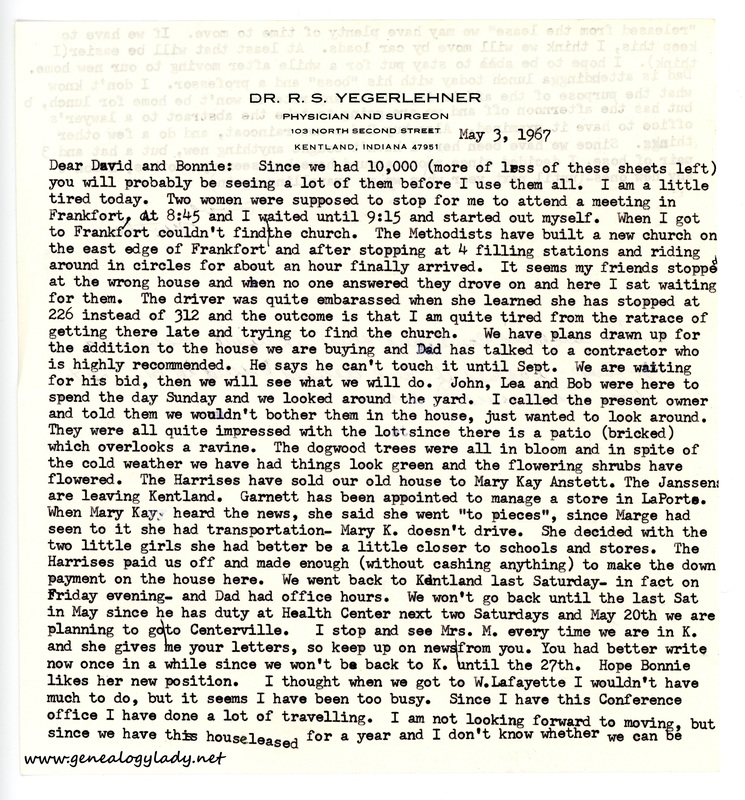 This entry was posted in Genealogy, Yegerlehner and tagged 1960s, Boston, Boston University School of Theology, David A. Yegerlehner, genealogy, Gladys R. (Foster) Yegerlehner, Indiana, John F. Yegerlehner, Kentland, Lafayette, Lena "Lea" (Keith) Gieselman, Mary Kay Anstett, Massachusetts, Robert Gieselman, Roscoe S. Yegerlehner on April 3, 2017 by Deborah Sweeney. 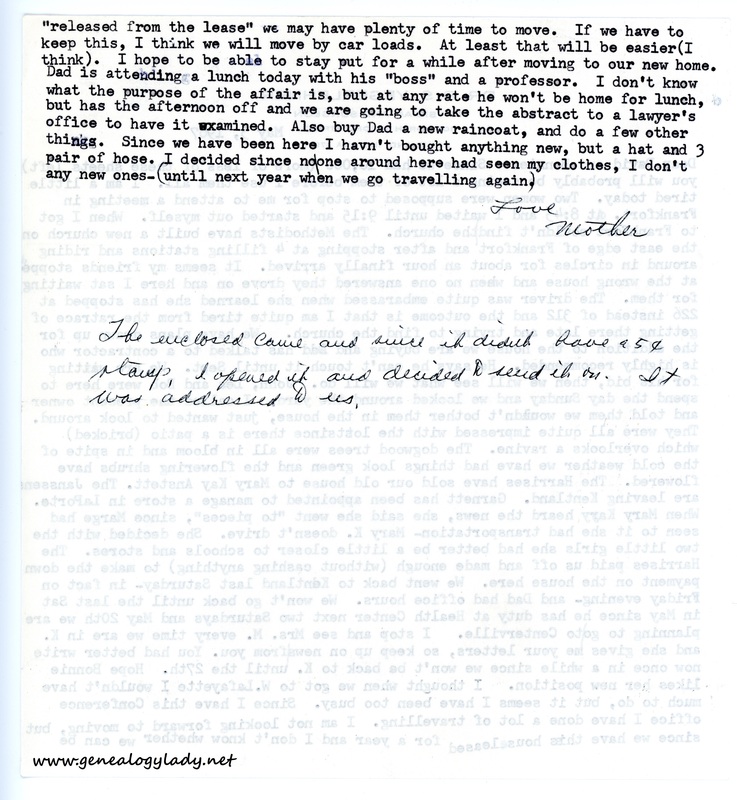 “The Harrises have sold our old house to Mary Kay Anstett.” That might have been the woman that David and I met when we visited Kentland….lo these many years ago now.